Vons doubles coupons up to $1.00 value. Vons often has coupons in the weekly flyer. These can be combined with manufacturer coupons for extra savings. On Buy One, Get One FREE ("BOGO") offers, customers must purchase the first item to receive the second item free. BOGO offers are not 1/2 price sales. If only a single item is purchased, the regular price applies. Manufacturers' coupons may be used on purchased items only - not on free items. Limit one coupon per purchased item. Customer will be responsible for tax, CRV and/or bottle deposit on the purchased and free items. 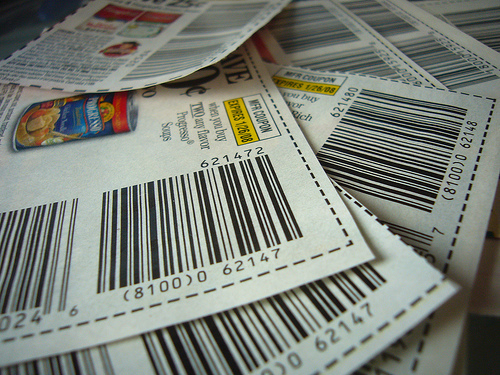 Applicable sales tax charged on Manufacturer's coupons. All manufacturer's coupons doubled are subject to the expirations and specific language contained in the manufacturer's coupon. The following are excluded from this promotion: all liquor, tobacco, fluid milk products, "Free" coupons, coupons marked "Do Not Double" or that exceed the value of the item, and except as we specifically advertise, any coupons that require the purchase of multiple items. If a coupon exceeds 50 cents and is less than $1.00, its value will be increased to $1.00. A limit of 1 coupon per household for each coupon offering will be doubled or have its value increased to $1.00. All other coupons of that offering will be redeemed at face value. All coupons $1.00 or greater will be redeemed at face value. A limit of five (5) FREE coupons per household will be redeemed. We reserve the right to accept, limit or refuse manufacturer's coupons issued by other supermarkets. Albertson's accepts coupons at face value only. Albertsons often has coupon booklets available in store, these can be combined with manufacturer's coupons for extra savings. Super A accepts coupons at face value. Each weekly flyer has 4 coupons that double any coupon up to $1.00 total value. Superior Market, Food 4 Less, & Payless Foods accepts coupons at face value only. CVS accepts coupons. They also issue store coupons at the in-store coupon kiosk or at the end of your receipt which you can combine with a manufacturer's coupon for extra savings. CVS also has coupons on their website. Target accepts coupons. Target publishes store coupons and they can be found online at their website. These can be combined with manufacturer's coupons for more savings.